great location (just right on top of a mall). No bathtub, quite disappointed. Breakfast selections are good. Are you looking for an accommodation with free breakfast and a comfortable environment? 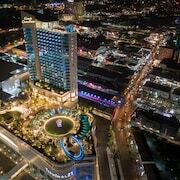 If you have trouble finding a B&B in the heart of Pattaya, there are 2164 other lodging choices to pick from in the area so you can find something with comparable amenities. If you want to lose yourself exploring fascinating exhibits, you might consider stopping by Anek Kuson Sala and World Gems Collection while you're in town. If you enjoy experiencing a new place through your taste buds, you'll be sure to enjoy Pattaya for its bar scene and array of dining options. If you're looking to find something to do during your travels, you might consider checking out Mini Siam and Hard Rock Cafe. You might put Three Kingdoms Park and Wat Yan Temple on your list if you want to see more of the area. What Are the Best Transportation Options In and Around Pattaya? Fly into Utapao (UTP-Utapao Intl. ), which is located 18.8 mi (30.3 km) away. You can also search for flights into Bangkok (BKK-Suvarnabhumi Intl. ), which is 52.6 mi (84.7 km) away. If you'd like to venture out around the area, you may want to rent a car for your trip.